February 27, 2017– Montreal, Canada – The AM1DM-NZ and AM2DM-NZ series are new additions to Aimtec’s unregulated power supplies. 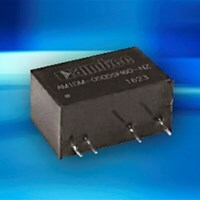 They feature an extended Momentary Short Circuit Protection of 3 seconds and are built with reinforced insulation to achieve a High I/O Isolation of either 6000VDC or 4200VAC based on the application needs. To lower the RF impact on these devices for this design is an ultra low Isolation capacitance of typical 5pF. Samples are available from stock and can be ordered immediately from any of Aimtec’s global network of franchised distributors. Visit www.aimtec.com for more product information or to locate your nearest distributor.